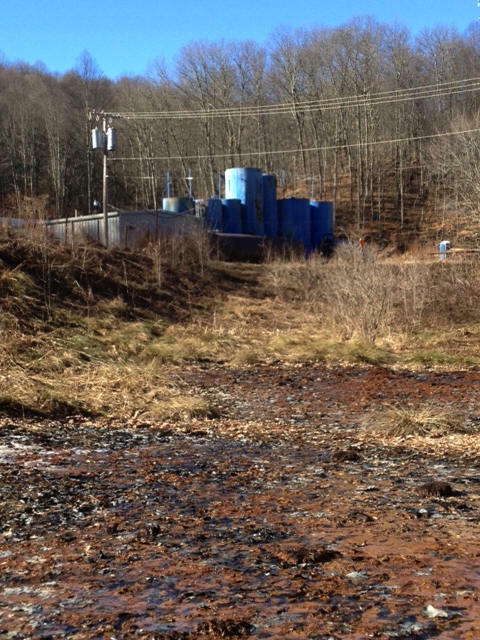 WV DEP Ignored the Air and Water Pollution from the Lochgelly WV Injection Well Site for Several Years. View the Evidence! Scientists have tested the headwaters of Wolf Creek and have confirmed that it is contaminated with toxic fracking/drilling waste compounds. Some believe that the fracking wastewater, which contains endocrine disruptors and cancer causing chemicals, is leaking from the injection well and/or the sediments pits, and could be contaminating the aquifer. The photos below were taken in 2013. The arial photo below shows Danny Webb Construction's injection well and sediment pits in Lochgelly, WV. It also shows what is believed to be the fracking wastewater/sludge seeping out of the sediment pits and into the headwaters of Wolfe Creek. Satellite images indicate that the sediment pits have been leaking directly into the headwaters of Wolf Creek since 2003. The distant photo below was taken in February of 2013. It shows the sediment pits/ponds near top of photo and the bank where the reddish oily frack wastewater is leaching out near the base of the sediment pits and into the headwaters of Wolf Creek. 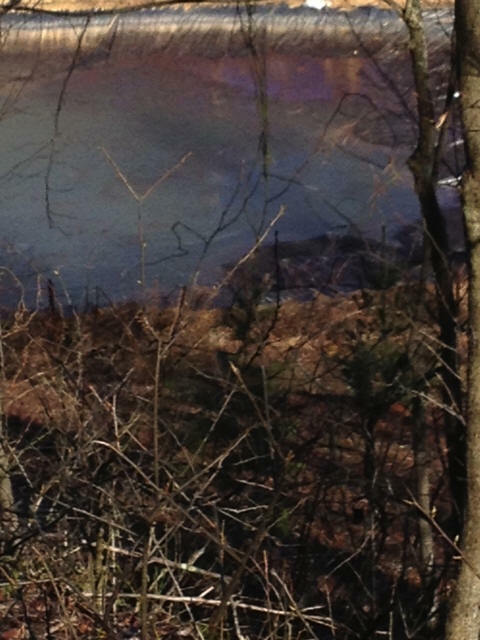 The distant photo zoomed in on the red and black oily waste sludge that is leaking from the base of the sediment pits. The pits are located up on hill to the left, not shown here. Building and blue tanks are shown in the background. The 2 photos below were taken in September of 2013, at least 3 months after the Public Hearing that was held in June of 2013. 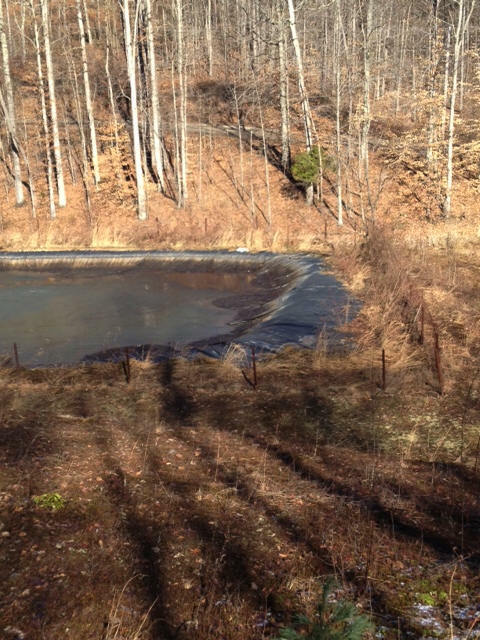 While WVDEP continues to deny any leaking sediment pits, the photo below clearly shows the new plastic pit liner that was placed over the old leaking pit liner in 2010. This solution allows the dangerous fracking chemicals to continue leaking directly into Wolf Creek. Eye witness testimonies and Satellite Images confirm that the sediment pits have been leaking since 2003. The photo below is a photo of the pit on the right side. It shows the black plastic liner sagging - and it more importantly shows that the pit has been leaking for so many years that the earth has absorbed the fracking wastewater sludge, which is why it continues to seep through the hillside and into the headwaters of Wolf Creek. 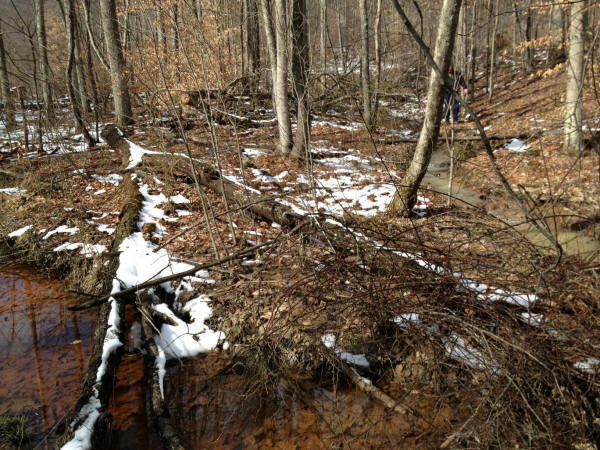 The photos below were taken in February of 2013 and shows the reddish oily frack waste sludge leaching at the base of sediment pit. Fence and pond at top of photo. The blue building and blue tanks can be seen in the background on the top right. 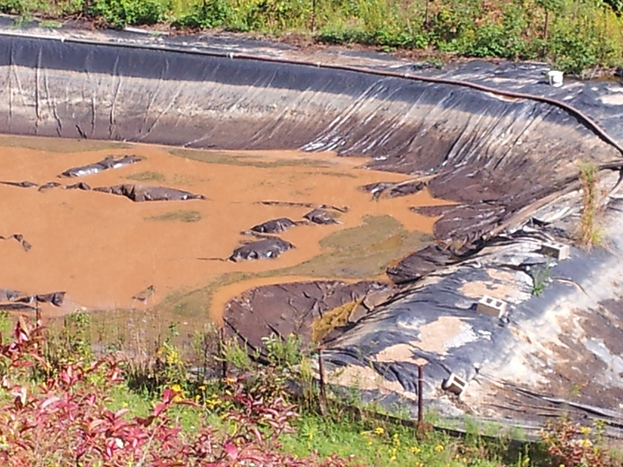 The zoomed in photo below shows the reddish oily fracking wastewater sludge leaching from base of sediment pit. 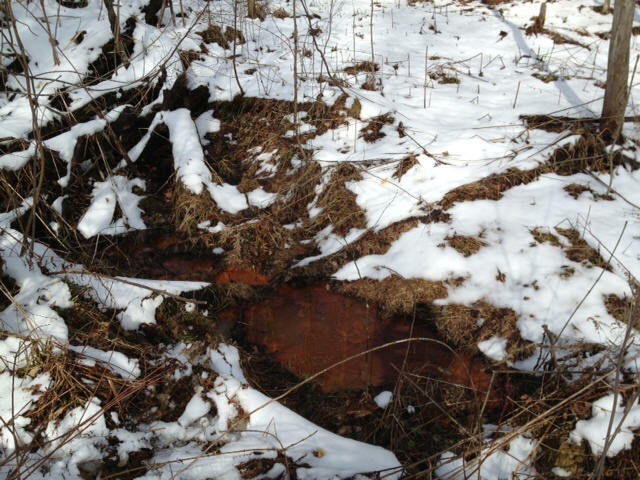 Close up photo of the reddish oily fracking wastewater sludge further down stream from the sediment pits. 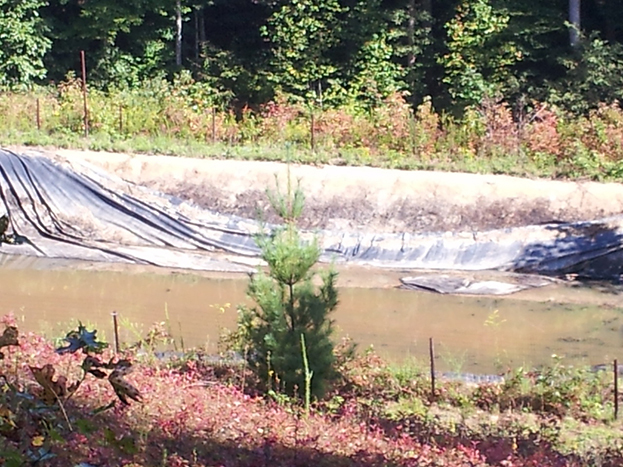 Photo below shows the red colored stream that is the fracking waste water flowing from the sediment pits. 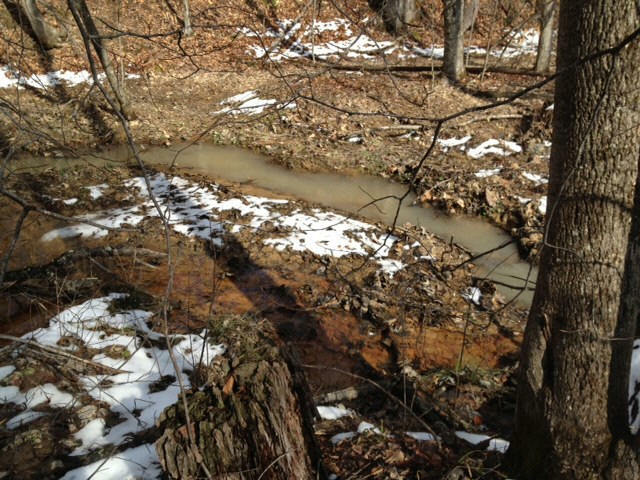 Photo below shows reddish stream with fracking wastewater at bottom left and the Real natural looking stream on the right. They meet up a tiny bit further down stream from the sediment pits to connect as one stream - Wolf Creek. 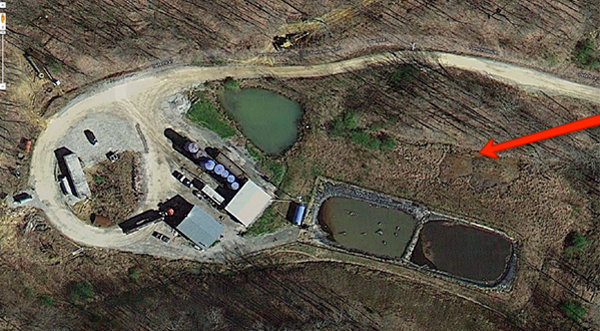 The photo below shows a distant view of the frack wastewater pond closest to the hillside. 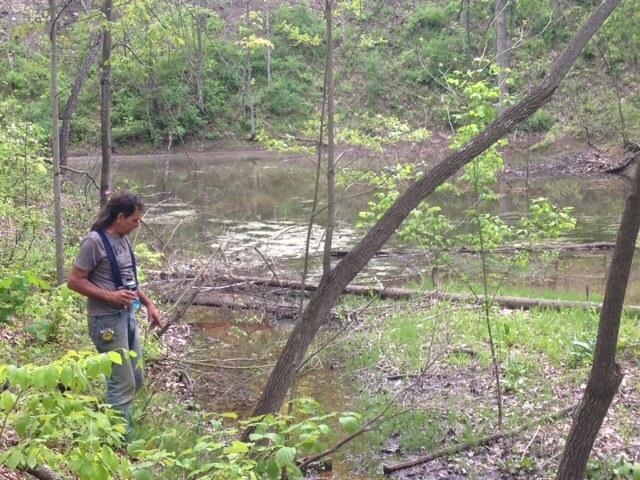 The wastewater is said to overflow the ponds sometimes which runs down the bank and into the adjacent stream. 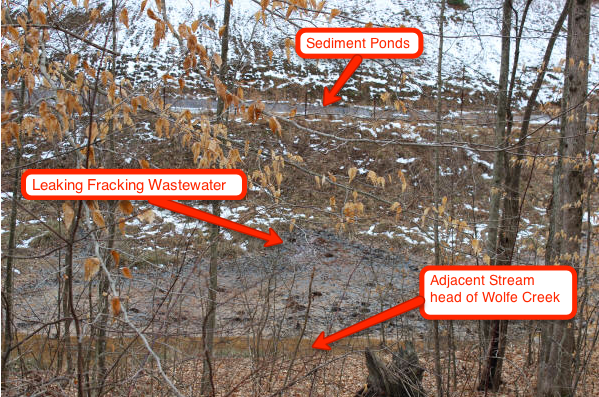 Look at the far right hand corner of the pond that shows the reddish oily fracking waste sludge. Then look at the photo below it. 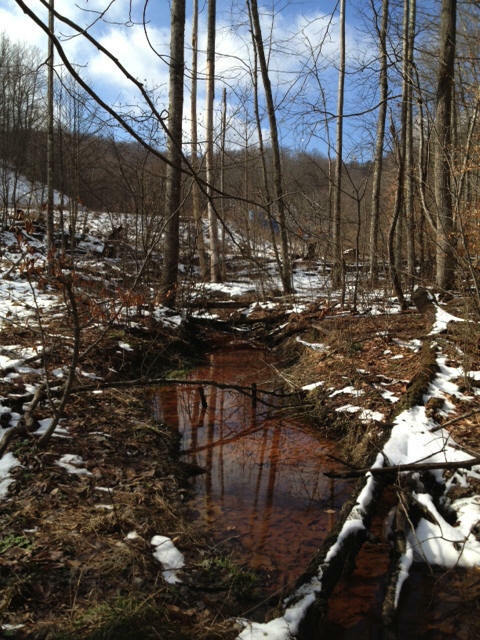 The photo below shows the same reddish oily fracking waste sludge floating in the creek which is coming from the nearby leaking sediment pits. The stream runs along the public access road to the sediment ponds. The photo below shows a larger area of Wolfe Creek (about a mile from the sediment pits and injection well) that has large areas of the reddish and silver oily pollution floating in it. A lot of local kids play and swim in Wolfe Creek every summer, even the tourist who visit the area. The photo below shows a close up view of the silver and reddish oily fracking sludge located along the banks of Wolfe Creek. This pollution was traced directly back to the sediment pits containing fracking wastewater which is located on Danny Webb Construction's property in Lochgelly, WV. Photo below shows pollution a few miles down Wolf Creek - at the entrance of Wolfe Creek Industrial Park located in Fayetteville WV. Nearby neighbors claim that pets and many animals have died after drinking the creek water. WATCH THE VIDEOS TO SEE ACTUAL CONTAMINATION OF WOLF CREEK. The 2013 Videos Below show that the headwaters of Wolfe Creek is Contaminated with Fracking Wastewater Chemicals. Click to watch videos. The video below was taken in May 2013, a couple of months after the fracking waste sludge was replaced with new fracking wastewater, just after Brad Keenan placed an emergency call to the NCR in March. Click to view. The video below was taken in May of 2013 and shows Brad Keenan explaining that Wolfe Creek is contaminated with petroleum waste from natural gas drilling. Click to view. The video below was taken in May 2013 and demonstrates that the Lochgelly frack dump is still not secured. 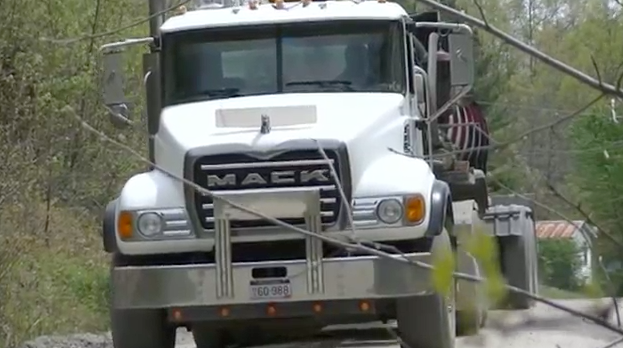 Large tanker trucks hauling fracking wastewater from other areas come and go as they please to dump their toxic radioactive waste into the sediments pits which are leaking dangerous chemicals into Wolfe Creek. Click to view. 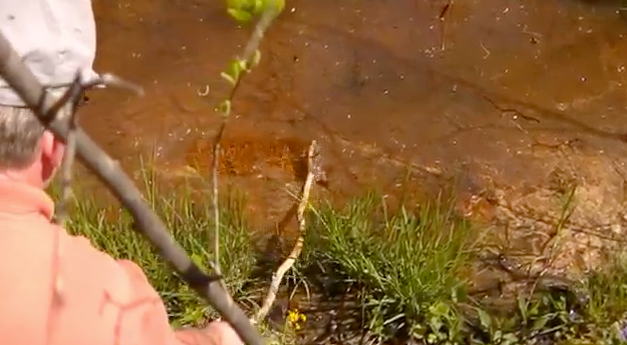 The two videos below were taken in February of 2013 and show the fracking wastewater sludge seeping out of the base of the sediment pits and into the adjacent stream/Wolfe Creek. Wolfe Creek is our backup water supply. 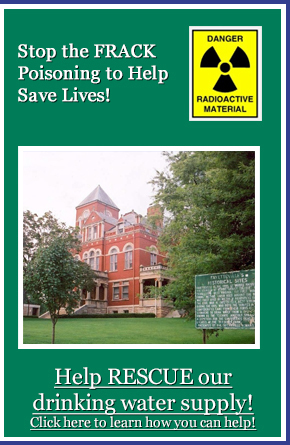 The video below was shown during the public hearing in 2007. 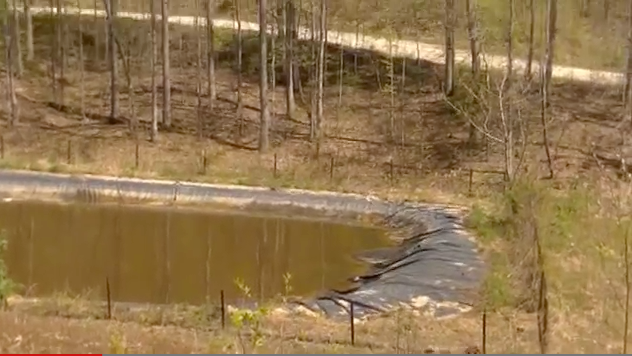 The video clearly demonstrates the poor management of the Injection well site. In 2007, Wolfe Creek, which was our only drinking water supply at that time, was tested by REIC laboratory. The test results showed that Wolfe Creek was contaminated with chemicals (DIESEL) directly related to the fracking wastewater. The test results and videos showing the pollution was submitted to WVDEP, Office of Oil and Gas and also submitted to Governor Manchin's office by Brad Keenan, but the WVDEP renewed Danny Webb Construction's injection well permit anyway - since it benefited the natural gas industry.